In your conversation settings, you can set up how you wish to be notified when a visitor initiates a chat or sends an email. In the left sidebar menu, navigate to Conversations > Notifications. Click to toggle the Browser tab notification switch on. Then, click Save. In the General Settings section, select the Floating notification sound checkbox to turn on sound notifications. Please note: to trigger the floating notification sound, floating notifications must be enabled and the user must be in the conversations inbox. Clear the specific notification checkboxes to disable individual notifications for new, reassigned, or unassigned conversations. If no one is online and available to respond to an incoming chat thread, these conversations will be located in the Unassigned view in the conversations inbox. To receive notifications via the Slack integration, in your notification preferences, navigate to Notifications > HubSpot Integrations. Then select the checkbox(es) next to the assignments you want to be notified of in your Slack channel. 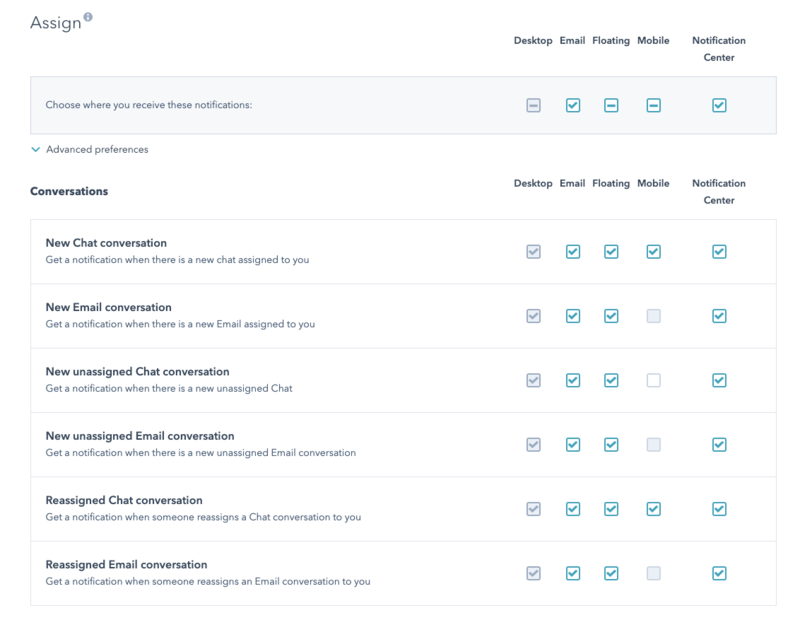 Users will only receive notifications from unassigned conversations after they have visited their Conversations inbox at least once. If you have followed the steps above but are not receiving notifications, ensure that your browser settings are configured to support push notifications.